Scott, the kids, and I just returned from our 3 day trip to Orlando. One of the reasons we love Orlando is because they have great restaurants. And while we did dine at one of our favorite spots, Whole Foods, I do eat other places too! The girls love to eat at Sweet Tomatoes. Even though this is an all-you-can-eat spot, they have so many great, nutritious options that I love to go here because I get what I want and my calorie-consuming, quick-to-burn-it-off husband and consume all he can. Stick to the vegetables, broth-based soups, sweet potatoes, and fruit, and avoid all the “extras”- sauces, cream-based soups, excessive slices of foccacia bread, and too much frozen yogurt toppings and you’ll do great! We also love First Watch. It is a chain that is slowly starting to pop up around the country. They serve breakfast all day along with sandwiches, soups, and salads. They have a lighter section in their menu and offer egg whites and egg substitutes at no additional charge. 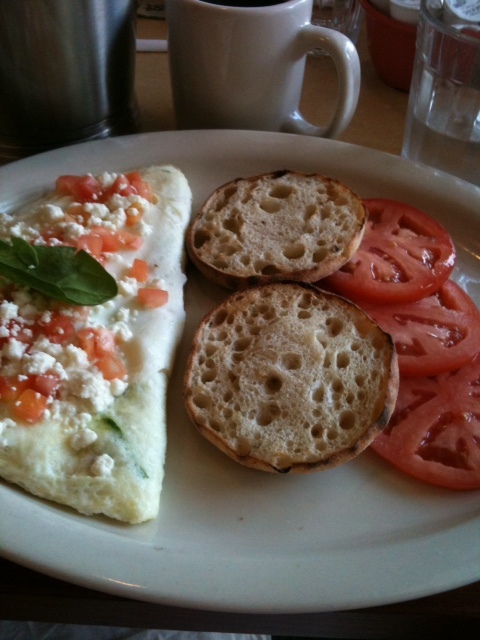 Here is a picture of my turkey, feta, and tomato egg white omelet. And both places offer coupons when you sign up on their websites! Ruth- A Shining Example of Romans 8:28!